Andrew Cheng asked for advice on the best ways to transfer files between his Android phone and his Windows PC. The obvious way is to physically connect the phone to the PC, then drag and drop. But the obvious way isn't necessarily the best--or the most convenient. But let's start with that obvious way: Use a Micro USB cable, such as the one that almost certainly came with your Android device, to connect that device to your PC. The first time you do this, you may have to wait a bit while Windows sets up some drivers. After that, the device will behave like an external drive. You can open it in Windows Explorer (File Explorer in Windows 8) and drag and drop files. But as I said, there are more convenient ways, and they don't require a cable. 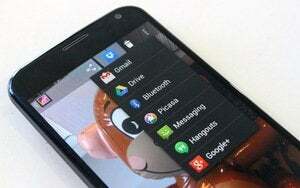 Cloud storage services such as Dropbox, Google Drive, and SkyDrive all support Android. You can send files, via each service's Android app, from the cloud to your device or from your device to the cloud. And everything you have stored in the cloud with one of these services automatically gets on your PC. Let's consider Dropbox. In Android, Dropbox doesn't automatically sync all of the files in its appointed folder as it does in Windows. But you can download files from the Dropbox app to your phone or tablet's local storage. And you can upload files to Dropbox via an Upload here option on the app's pull-down menu. In order to avoid hitting your mobile data cap, you'll probably want to leave the Wi-Fi only option on. Once this is set up, every time you snap a picture with your phone, it will automatically transfer to the Camera Upload folder inside your PC's Dropbox folder. You can also transfer your local music collection without a cable, using your local Wi-Fi network. In other words, it only works when you're at home. I recommend the free program doubleTwist. On your PC, it's a media sync tool that works with either a cable connection or Wi-Fi. The Android app is an excellent music player in its own right--as well as the other end of the syncing tool. With these tools, you'll seldom need the cable for anything but recharging.